STEPHEN R. PLATT is a professor of Chinese history at the University of Massachusetts, Amherst. His last book, Autumn in the Heavenly Kingdom: China, the West, and the Epic Story of the Taiping Civil War, was a Washington Post Notable Book, a New York Times Book Review Editors' Choice, and won the Cundill History Prize. Platt lives with his wife and children in Northampton, Massachusetts. "[A] superb history... Platt has written an enthralling account of the run-up to war between Britain and China during a century in which wealth and power were shifting inexorably from East to West... Imperial Twilight is a masterpiece of the "If Only" school of history, which holds out the tantalizing prospect of a world that, with the right choices, could be made perfect. "Excellent... A beautifully written and expert account of western aggression in 19th-century China... Platt writes beautifully, with a novelist's eye for detail. He skilfully weaves through the book a cast of eccentric characters." "Masterly . . . [Platt's] book is important reading not only for those interested in China's history but also for anyone seeking to understand the explosive intersection between trade and politics today." "A fast-paced story that focuses on the individuals who made the history... Wonderful... For many years, [The Opium War] was explained not as a war waged by a nation on behalf of its druglords but as a necessary evil designed to open up a country that had cussedly closed itself off to the benefits of interaction with the 'civilized' world... Platt's book upends these stereotypes." "A vivid picture of the history of relations between Britain and China from the mid-18th century up to the outbreak of the war... This thoroughly researched and delightful work is essential for anyone interested in Chinese or British imperial history." "Clear writing and an excellent sense of story and scene-setting mark Platt's compelling reexamination of the causes of the First Opium War... Platt brings to life the people who drive the story, including the missionaries desperate to learn more about China and its language, the drug smugglers who made so much money they still have name recognition, the officials desperate to handle a growing crisis of widespread opium addiction, and even a pirate queen and Jane Austen's older brother. Platt's vivid and compelling major reassessment will shift our understanding of the First Opium War." "A deeply researched study of an early clash of civilizations, when England attempted to impose its will on East Asia… A fluent, well-written exercise in revisionism, one of interest to students of modern geopolitics as well as 19th-century history." 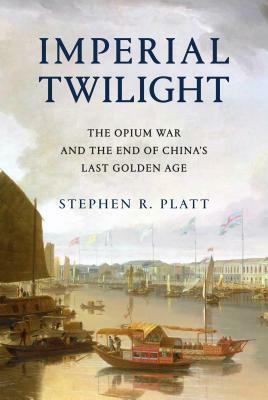 "A fresh perspective on the first Opium War, the conflict that allowed Western merchants to pry open China’s riches and gain unprecedented trading privileges… Platt's research is impeccably presented in this winning history of British and Chinese trade." "Entertaining and well-paced... Platt's compelling book is a sobering read that should focus the minds of those who like to talk of the achievements of the Victorian age without thinking about how those were achieved, or how they were funded." "Charming... Meticulously researched... A rich and finely balanced account of how Britain and China came to blows." "With a great canvas to play upon and vivid Western and Chinese sources into which to dip his brush, Platt paints a superbly engaging portrait of Anglo-Chinese relations across five deeply consequential decades... Platt's talent for rich detail offers both entertainment...and unease as we head towards 1839, and find that international relations turn less on cultural misunderstanding than on what well-informed people decide to do with what they know."